About 6 years ago, I came up with the idea to use the relaxed freedom of summer to tackle some of the biggest books on my TBR shelf that I'd been wanting to read but never seemed to have the time for. One of my book groups takes time off during the summer, so with fewer interfering commitments, I declared it The Summer of the Big Book and really enjoyed delving into some hefty tomes, like The Passage and Pillars of the Earth. It was so much fun that five years ago, I created this challenge so that YOU can join me! And here it is Memorial Day weekend again and the unofficial start of summer 2017. So join in the fun! The challenge will run from Memorial Day weekend (starting May 26 this year) through Labor Day weekend (Labor Day is September 4 this year). Choose from what's on your shelves already or a big book you've been meaning to read for ages or anything that catches your eye in the library - whatever peaks your interest. Sign up on the first links list below (or on Goodreads if you don't have a blog). 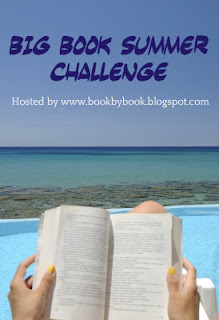 Write a post to kick things off - you can list the exact big books you plan to read or just publish your intent to participate, but be sure to include the Big Book Summer Challenge pic above, with a link back to this blog (no blog? No problem - see below). You can write progress posts if you want to and/or reviews of the big books you've read...but you don't have to! There is a separate links list below for big book reviews or progress update posts. I also started a group on Goodreads for the 2017 Big Book Summer Challenge, where we can talk about Big Books and our progress on the challenge. If you don't have a blog, you can also use the Goodreads group to sign up for the challenge, post updates, and show which Big Books you are reading! Sounds good - take a look at your upcoming to-reads and see if any are 400+ pages! Looking forward to doing this one again this year!! It's over already?! I just linked up my reviews and Wrap-up Post. Thanks again! I know - although my summer was pretty hectic, the reading part went by too fast! Thanks for participating, Darlene - I will check out your posts.